Taylor English Decisions provides clients with guidance on improved and innovative business operations as well as an understanding of the complex nature of public policy. Individual members of the Taylor English Decisions team also received recognition in additional James Magazine categories. For the first time, Trey Paris, managing director of Taylor English Decisions, was recognized in James Magazine’s Hall of Fame. Paris brings more than 30 years of experience in public affairs, government relations, corporate communications, shareholder relations and issues management to the Taylor English Decisions team. 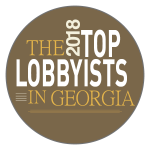 Additionally, William Woodall, a member of Taylor English Decisions, was ranked among the top 25 on James Magazine’s Top 50 Lobbyists list. For the last 20 years, Woodall has developed expertise in tax policy, agriculture, transportation, natural resources, and economic development. The listings are available in this month’s edition of James Magazine here.